LONDON, England (CNN) -- Botanists believe they have discovered one of the world's largest carnivorous plants in Southeast Asia. Nepenthes northiana - the carnivorous pitcher plant prepares to tuck into a rat. The giant pitcher plants were located on Mount Victoria in Palawan, central Philippines by a team led by UK botanist Stewart McPherson. The second largest species, now called Nepenthes attenboroughii, has been named in honor of the UK's world-renowned natural history presenter Sir David Attenborough. The new discovery measures up to 30 centimeters in diameter and is formed by a tendril which inflates into a large cup-shaped trap. McPherson told CNN: "Around the mouth of the pitcher are secretions of nectar which attracts insects and small animals. The rim has lots of waxy downward-pointing ridges which help prey fall directly into the pitcher. "The pitchers are half full of a liquid consisting of acids and enzymes which help break down its prey." The insectivorous, sometimes carnivorous diet is crucial for the plants' survival says McPherson. "These plants grow in really harsh areas where soil quality is very poor -- often pure gravel or sand. Catching insects allows the plant to augment nutrients that it otherwise wouldn't have access to." McPherson along with his colleagues Alastair Robinson and Volker Heinrich have discovered more than 20 new varieties of pitcher plant in recent expeditions and have also made two rediscoveries. One of those rediscoveries, Nepenthes deaniana, was first recorded in 1907 but was subsequently lost when the Philippine National Herbarium in Manila was bombed towards the end of World War II. McPherson and his team believe they are the first explorers to observe the plant in the wild in over a century. The Nepenthes deaniana produces a spectacular, football-sized, red pitchers that are large enough to catch insects and small animals. In many of the traps, McPherson's team found giant centipedes and 10 centimeter-long spiders. The Botanical Society of America says that there are around 600 species of pitcher plants. Most familiar, perhaps, is the Venus Flytrap. 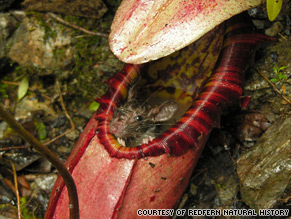 But bigger species like the Nepenthes attenboroughii, Nepenthes northaina and the world's largest known pitcher plant, Nepenthes rajah are able to capture animals as large as rats, as can be clearly seen in the picture above. "These plants have evolved to catch insects. But on rare occasions they do catch rats and mice. The first reports of these plants catching rats was made in the 19th century by a British explorer called Spenser St John," McPherson said.